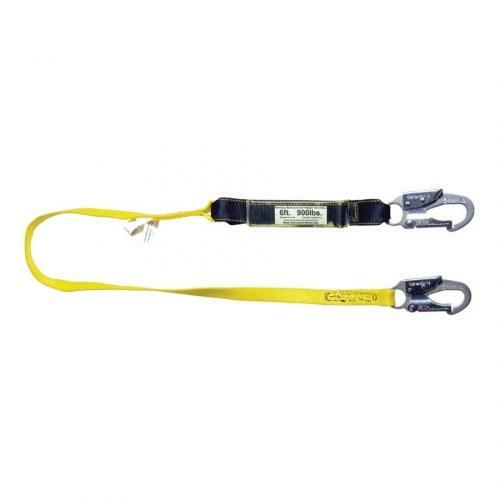 6 ft Guardian Fall Protection Single Leg External Shock Lanyard at Capitol Materials Coastal, Inc. The Shock Absorbing Lanyard is the premiere free fall lanyard offered by Guardian Fall Protection. It meets all the stringent ANSI Z359.13-2013 regulations, and the integrated shock absorbing component limits average arresting forces to 900 pounds or less. It is comprised of 1" nylon webbing, and is available in a variety of lengths and connector options, including steel and aluminum snap hooks and rebar hooks, all of which make it one of the most functional and durable lanyards on the market.